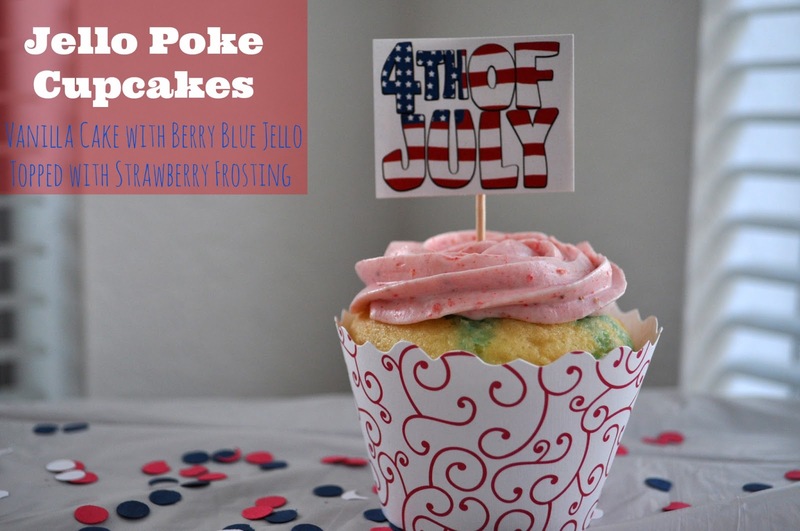 Chronicles of a Foodie: Patriotic Jello Poke Cupcakes! Back by popular demand...Cupcake Couture Blog Party...part deux! 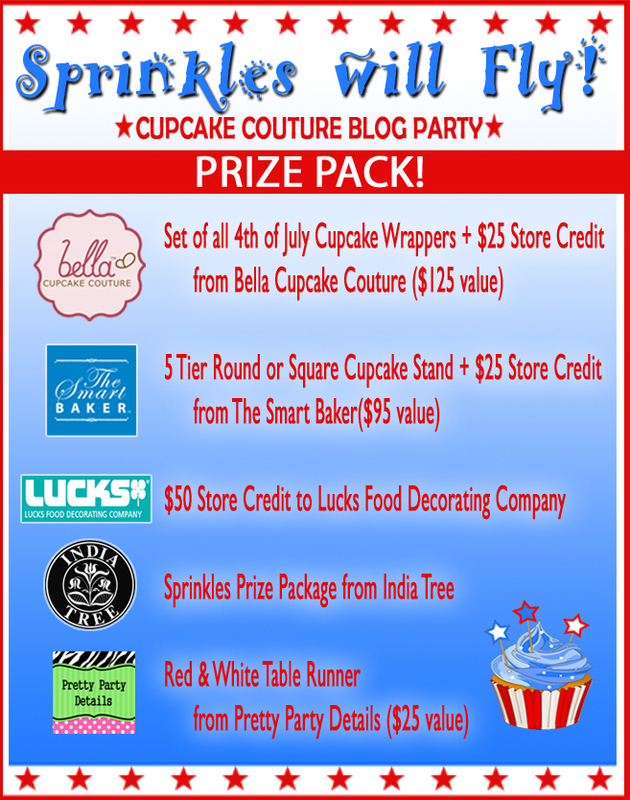 We had so much fun participating in last month's Cupcake Couture Blog Party that we decided to do it again! The theme this time around was, "Sprinkles Will Fly!" 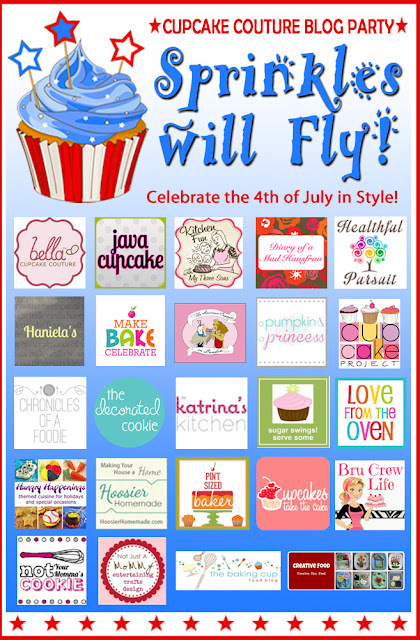 All 24 participating bloggers were sent Bella Cupcake Couture wrappers that were either red, white, blue, had stars or stripes...essentially, Fourth of July-esque themed wrappers. We were again asked to develop a recipe that would match well with our wrappers so be sure to check out what my fellow bloggers came up with! This time around we were sent this gorgeous Olivia Swirl Red and White wrapper! They were perfectly simple and I knew they would pair well with any cupcake I decided to make. For the display I recycled some folders in my office and hole punched them to make DIY confetti! The cupcake toppers were just a Fourth of July themed clip art that I printed out, glued to some cardstock, and cut up into nice little squares courtesy of a nifty paper cutter at work! I literally taped the square to a toothpick and voila! 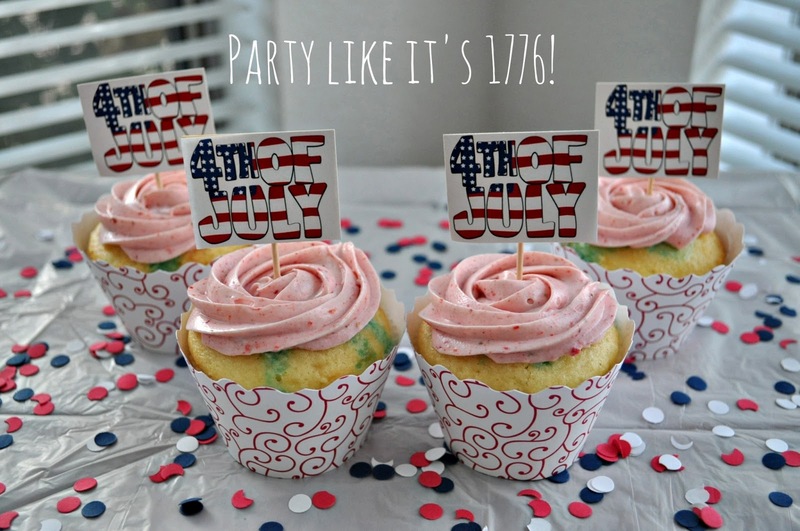 A homemade, DIY cupcake topper! It makes me wonder why people buy paper cupcake toppers from Etsy! Super easy to recreate at your own patriotic party! So now let's talk cupcakes. I decided on Jello Poke Cupcakes because it sounded fun and it was a creative way to bring my color scheme together. I had always heard of poke cakes but I had never attempted them. Also, kids love cupcakes, and kids love jello, and I have two younger brothers who are 9 and 10 who would be devouring the majority of these cupcakes so I figured it was the perfect childhood dessert hybrid! Like I said, these cupcakes are semi-homemade, which means I literally took a box cake mix (sacrilegious I know!) and spruced it up a bit to make something you wouldn't know wasn't made from scratch! Plus, this recipe is very quick to put together so you can feel free to make it a day ahead and your Jello Poke Cupcakes will be ready to serve at your party the next day! Because I wanted a red, white and blue cupcake, I decided to make a Vanilla cake with Berry Blue Jello. Similar to my frosting for the last Cupcake Couture Blog Party, I used a canned frosting and repurposed it into Strawberry Frosting using powdered Freeze Dried Strawberries. I can't say enough how much I LOVE using freeze dried fruits. They are an actual piece of fruit just freeze dried, so you get that fresh fruit taste without worrying about their juices ruining the consistency of your frosting or cake batter. They're absolutely packed with flavor too! After you bake the cupcakes according to the box let them cool for about 10-15 minutes on a cooling rack. This is the fun part...grab a fork and start poking holes into your cupcakes. Don't massacre them though, just poke enough holes in it so that when we pour the Jello on top of them that it gets absorbed into the cupcake and doesn't just roll off the sides like a few of mine did. 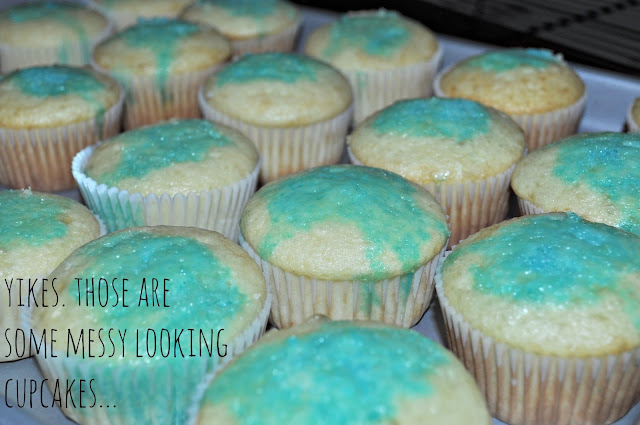 I know the cupcakes look a bit messy but trust me, it'll be worth it in the end. After you've spooned your Jello mixture over all the cupcakes pop them in the fridge to chill for about 30 minutes, just to get the gelatin to set a bit. Once everything is nice and cool frost your Jello Cupcakes anyway you please! I piped my frosting on using an open star 1M tip just because I wanted a pretty frosting design. After you've frosted all your cupcakes you can return them to the fridge until you need them, but make sure you sneak a taste of one. You won't be disappointed! The Berry Blue Jello is surprisingly not over sweet in the Vanilla cake, and it just added a different level of moisture to the cake. The Strawberry frosting pairs nicely with both the Vanilla and Berry Blue making the cupcake taste kind of like a fruit shortcake! Yum! Follow the directions on the cake mix to make your cupcakes. Once cupcakes are baked and cooled, take a dinner fork and poke holes in all the cupcakes. Empty Jello mix into bowl and mix with boiling water until the mix is dissolved. Spoon the Jello mixture over the top of all of your cupcakes. You don't need to use the whole bowl of Jello but you can if you want to. Stick cupcakes in the fridge to chill for 30 minutes before frosting. Dump canned frosting into a stand mixer (or bowl if you're using a hand mixer). Take your freeze fried strawberries and add them to a food processor. Pulse until fruits are powdered. Add powder to frosting and beat on low for 1-2 minutes until everything is well blended. You may add more strawberries depending on how fruity you want your frosting. To enter to WIN this Prize Pack, simply fill out the entry form below. Contest opens June 25, 2013 at 7:00AM PST and closes July 1, 2013 at 11:59PM PST. One winner will be chosen and announced within 48 hours of the contest ending. Winner will be contacted via email by betsy@javacupcake.com and will have 48 hours to claim their prize. If they do not respond within 48 hours, another winner will be chosen. This contest is open to residents worldwide. Congratulations to Becky Nelson from Hampton, VA! Yummmmm! I LOVE the toppers you made! So cute! Your cupcake toppers are great. I've never used dried strawberries in frosting, but that sounds like a fantastic idea. I'll have to try it! I have never tried the freeze dried fruits...I will keep my eye out for those!!! I love jello poke cakes...so cute in cupcake form! And those toppers are adorable!!! So perfect on these cupcakes! Jello Poke Cupcakes - What a great idea! Those toppers are fabulous and your homemade confetti is a touch of genius! I love the red and white wrappers you used for the cupcakes! They tie in perfectly to the 4th of July theme. Gosh, those wrappers are cute!! I like the Navy swirl ones - so classy looking. Jello Poke Cupcakes are a great idea..love them!! I'm singing the Jello song in my head now!! These look so fun to do with children. The red and white cupcake wrappers turned out cute paired with the cupcake picks too. Great job! I love poke cakes, so cute! I still have never tried a poke cake! I neeeeeeeed to! I love those wrappers. Great idea to make your own toppers instead of buying them! I love the toppers you made, they are so cute! Not only are these adorable but they look so delicious!